In India, all Hindu prayers, all new endeavours, all simple routines of daily life, along with the most ambitious of projects are preceded by the invocation 'Salutations to you, O Ganesha'. 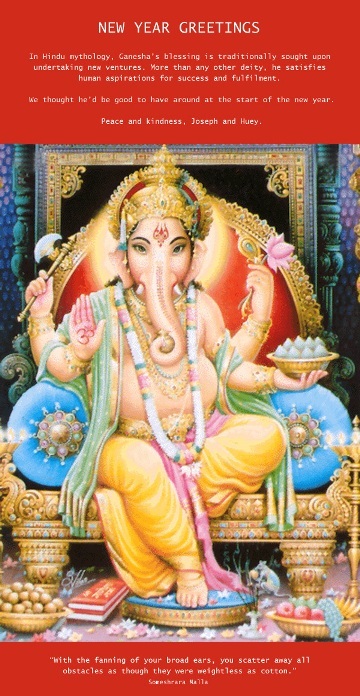 Ganesha is you see, the patron deity of new ventures and the one who bestows blessings. That's why my partner and I chose him as the focus for our new year e-greeting to friends and family. As the email said 'we thought he'd be good to have around at the beginning of the new year'. There are so many moving and evocative invocations to Ganesha it was difficult to choose one for the card, although we both loved the image of his ears scaterring even the heaviest of mortal obstacles as though they were 'weightless as cotton'. But its clearly not just his ears which come in handy in sweeping away human challenges. 'I adore thy trunk flung up straight in the joy of the dance, so as to sweep away the clouds...' Kathasaritsagara.